Download Voodoo at Cafe Puce now and read online! $12.50 ea. During a week spent in Paris, Rev. Louis Martinie and Rev. Severina's travel log and journal became and essay on Voodoo, the Ancestors, healing the past and the Myth of Sisyphus. Lavishly illustrated with graphics and photographs of Paris and Louisiana. Voodoo at Cafe Puce is now offered as an e-book download. A unique document by two of the foremost Voodoo practitioners in New Orleans today. A must-read for anyone interested in Voodoo and New Orleans culture at the very time when it is endangered. Written in coffee-houses on a six day trip to Paris by Voodooists, Louis Martinie and Severina KarunaMayi Singh, this book confronts the past as well as the present and looks to the future. KarunaMayi, Medicine Woman and Voodoo Priestess says, " As a Medicine Woman, I use awareness to sense the Good Medicine and attract it to where it is needed. As a Priestess of Voodooo, I celebrate and return the Good Medicine to the Creator, as offerings to the Good Spirits, our allies and our guides. The Voodoo Spirits are our Guardians, our Angels"
Voodoo Priest, Louis Martinie says, "How do I begin a pilgrimage? I begin with the first step. I end with the last step. This is true but arbitrary. Each moment, each step blends one into the other. We are creatures of parts and our parts have made seamless connections with myriad others within an endless fastness. We hold hands with infinity as we travel through eternity." • Learn about the Voodoo Spirits and what they control. • Visit the past with KarunaMayi: the good, the bad and the ugly. • See Paris through their eyes and through the lens of Louis' camera. • Read the journals that reveal their most inner thoughts and the feelings in their hearts. • Share in the depth of their love in Louisiana as they describe its lush landscape and spiritual wealth. Upon their return to Louisiana their KarunaMayi's and Louis' journals were revised, re-written and amplified, and their separate texts "married"when they met weekly at yet another cafe. This took about 9 months. Like with the birth of any child, there was anxiety and exhilaration. Finally the draft went to the printer on Bastille Day which could not have beem more fitting!! The second proof was over-nighted to them from New York on the night Katrina hit Louisiana and arrived two weeks later. The making of this book took at times sisyphusien aspects of its own! Voodoo at Cafe Puce is lavishly illustrated with graphics and photographs of Paris and Louisiana. A unique document by two of the foremost Voodoo practitioners in New Orleans today. We are proud to offer this first signed and numbered first edition, available only through the website. "This is a record of New Orleans Voodoo as it exists right now in ritual and in the hearts of its practitioners. In the time of Marie Laveau and Dr. John much happened and much was lost. This book,and books like it, preserve and communicate the present traditions of Voodoo as it is practiced in New Orleans. These traditions, our traditions, will not be lost. Voodoo at Cafe Puce is truly a unique record in time of the tradition of New Orleans Voodoo as it has nurtured and blessed its authors and today they are proud to return this book as a humble offering to the living Spirits of Louisiana. A must-read for anyone interested in the beliefs and practices of Voodoo and a contemporary record of Louisiana culture, at its most poignant time. "I just started Voodoo at Cafe Puce and so far I am loving the book. I can't wait to get home tonight so I can continue reading it. It has given me answers to many questions and I look forward to the rest of the book." 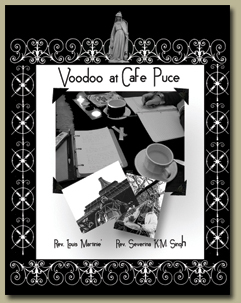 "Voodoo at Cafe Puce is a stunning literary travel on faith, self-knowledge, and the energy of our own spirits by Rev. Severina Karuna Mayi Singh and Rev. Louis Martinie, two leading authorities on spirituality. This book is an extraordinary retrospective covering the spirits, ancestors, personal development and magical events throughout their travels that exercise both pain and beauty...this book is definitely "the wink in the eye of God"
".. I really like my Marie doll. I also finished reading your book. It was delightful. I felt as though I had been on the journey to Paris. I hope you sell a zillion copies! With much respect,"
"I love your book. The writing is enchanting, and the pictures are gorgeous. Your co-author also seems to be an interesting, intelligent, and spritual person as well. What a nice combination of your two perspectives." "Just finished your book, and it was wonderful to get to accompany you on your journey.....great read.."
- M.A. Bay St Louis MS.
"I received the book and enjoyed it immensely. I gobbled it up in one afternoon and evening - so enjoyable and interesting!...." The pictures were wonderful, and the story itself was incredible. What a journey! I dreampt of it all night, and woke up this morning, the book on my mind. A very good investment for study. I doubt there is anything at all like it anywhere else...... I just cannot fully tell how much I enjoyed it. I read it quickly, and will go back to re-read it again. Very useful, and very beautiful. Thank you for the recommendation." "I loved your book - just seemed like you got this whole spectrum of emotions when your reading it you know. Amazing"
"I really enjoyed reading your book, it is a simple and candid expose of your beliefs and how you got there. It is the theory of how everything works."